Previously, we talked about the major scale. We constructed a C major scale, which happens to contain no sharps and no flats. Then we created some other major scales based on the same exact scale formula; that is, with the same exact type of steps as the C major, but starting from a different note other than C.
Let’s take the fifth note in the scale of C major (the tone “G”) and use that note to make a new scale. What will the names of the notes be? From G we will apply the formula of whole and half steps, using the chromatic scale as our source: wh, wh, h, wh, wh, wh, h. The result is G A B C D E F♯ G.
When writing notation, will we always write a sharp when F appears? That seems annoying. So the standard practice is to declare it at the beginning of a piece of music, called a key signatureA marking used at the beginning of a piece of written music to indicate the key; normally, which notes will be sharp or which notes will be flat. (But not both) (pictured). This symbol indicates that, until otherwise specified, all “F” will actually be “F♯”. Notice that the sharp is placed squarely over the line of the treble clef note F. This key signature will represent the key of G major. While useful in understanding notation, key signatures are also valuable even if we never read music. This is because they are an effective way of visualizing music. Let’s re-examine the G scale. What if we spell a new major scale from the fifth of G? The fifth note of G is D. Applying the formula once again to the note D, we will produce the notes D E F♯ G A B C♯ D. A pattern has emerged. Every time we start a new scale on the fifth of a key, a single sharp is added to the old key signature, resulting in the new key signature. We’ve seen how a single sharp can be added to a key. What about flats? Flats work the same way. If we start again from our neutral C major scale, and spell a major scale out from the fourth degree, F, the results are: F G A B♭ C D E F—one flat is added to the key. This pattern can be plotted into a visual diagram called the circle of fifthsA commonly used method of arranging various keys (or major scales) so that they can be organized by number of sharps or number of flats.. It is so predictable that musicians studying music theory frequently use it to memorize the key signatures. From any major scale: start a new scale on the 5th degree, and the new scale will be the same as the old scale but with one additional sharp. The sharp will be in the position of the seventh note of the new scale. A new major scale (whole, whole, half, whole, whole, whole, half) starting from the 5th note of C major must have one additional sharp: F♯. A new scale, started from the 5th note of G major. In addition to the F♯, it has another new sharp: C♯. Memorize the mnemonic: “Father Charles Goes Down And Ends Battle” and remember that it’s reversible for the flats. 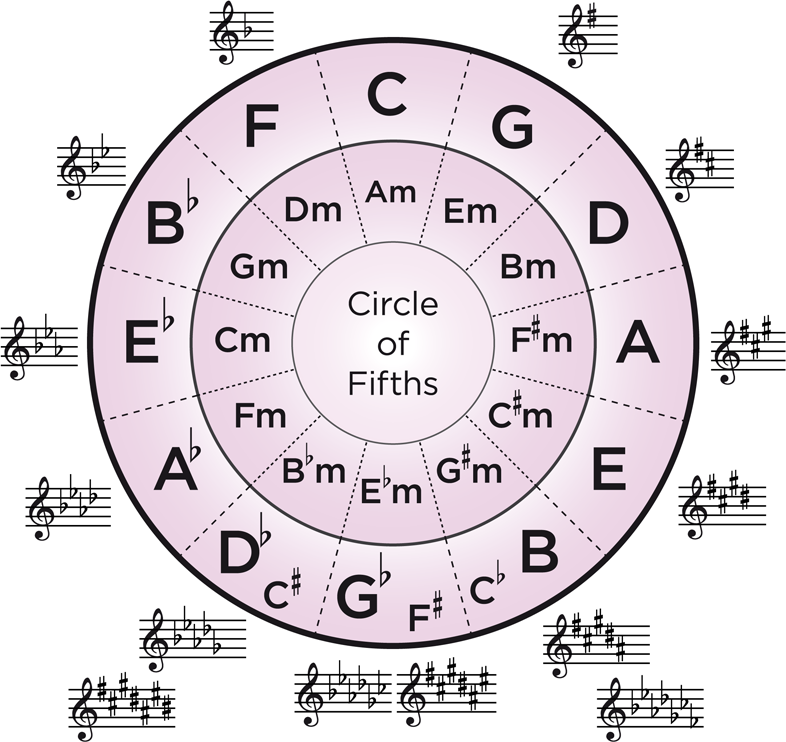 Write down the keys in the circle of fifths from memory. How many flats are in A♭? What are they? How many sharps are in B? What are they?